Join us on October 26 at the Leroy Neiman Center! 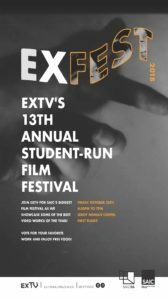 ExFEST is SAIC’s 13th annual film festival and held every year in the fall semester. Made by students, for students, this gives our filmmakers and artists a great way to win festival awards, show their work in front of a select jury and audience, and showcase some of the best video art made at SAIC! ExTV strives to bring students of the FVNMA department and those with interest of video work together and engage a community that fully represents all our video artists at SAIC. In our 13th year hosting ExFEST and 20th year anniversary of ExTV, we are honored to be screening 12 outstanding artists and 14 different works in total and seeing all of you there! ExFEST will be talking place on the first floor of the Leroy Neiman Center (Sharp) on Friday, October 26, 2018 from 4:30pm to 7pm. Do I need to pay for a ticket? Nope! Come with a friend and an appetite because ExFEST will be fully catered with free pizza and snacks to enjoy during the screening!